John Moore, Senior Research Engineer at CAVS-E, was guest lecturer for Mississippi State University's Manufacturing Processes Lab. The instructor for this Lab is Brian Smith, covering manufacturing processes and materials, interrelationship of product design, material properties, and processing methods, as well as robotics and CAM systems, and economic factors in material, process, and equipment selection. 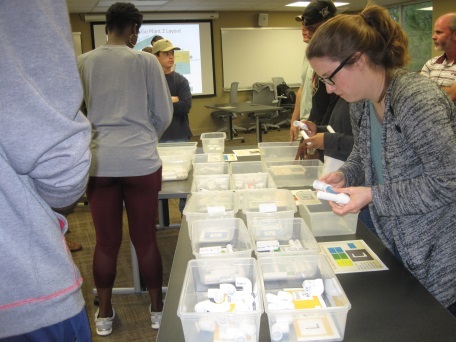 Moore teaches Lean to students, manufacturers, health care personnel, and others. Lean is a process of cost reduction and quality improvements that create more value for customers by minimizing waste. Customer satisfaction is the key to business success and Lean helps create an increased value for customers by reducing, or eliminating, unnecessary or wasteful activities, which frees up resources that can be reallocated for improving quality of speed of service. 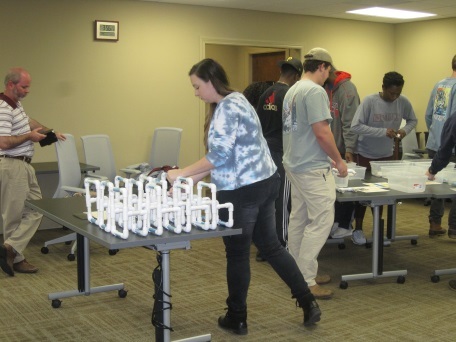 To demonstrate the importance of applying Lean practices, students were asked to participate in an activity following a presentation on Lean processes in manufacturing that enabled them to gain hands-on experience in lean principles. 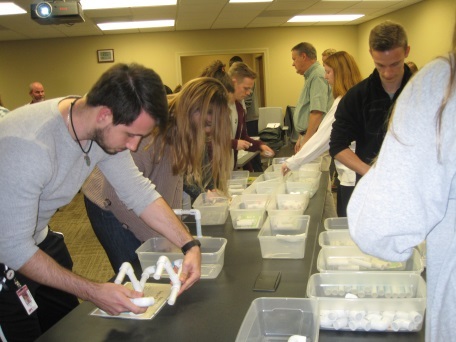 The first activity began with students simulating traditional mass manufacturing. They were assigned to positions on a manufacturing floor - from raw material supply as buggy pushers, to assemblers, to forklift operators. The students gave a valiant effort, but failed to produce the required customer order of 18 units in 5 minutes, by producing only 3 chairs. After completing this activity, students were asked to evaluate the problems with the methods used. The students then offered input on wasteful steps that could have been eliminated, and suggestions on how the process could have been improved. This feedback was then incorporated into round two of the activity, in order to better illustrate the importance of continuous improvement and flow. The students created a production line that eliminated wasteful activities, and improved quality, and the speed of service. They were then able to meet the customer's order by producing 18 units in less than 5 minutes. Finally, in round three the students were challenged to create a production design that could meet highly variable customer orders, without a loss in labor productivity. The students then created a "U-Cell" production system that met the customer's order requirements under multiple demand scenarios. The end result was a production rate of 24 chairs in 4 minutes.